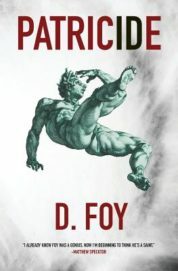 D. Foy’s second novel, Patricide, rumbles with violence, even when there’s none to be seen on the page. A dark, brave, complicated tale, it speaks to the rages that linger in men through generations, confronting the lashes provoked by cowardice, power, and addiction, and the crippled bonds that string fathers and sons together.
. . . without a word he struck my jaw with his full might, his giant fist, a blow, just one, that slammed me to the floor. And then the swirling haze . . . And then his Face, all black, my father’s, my father’s giant Voice . . . It had been real, you were there, the boy on the floor, yours was the jaw that met the fist. You’d seen his face, your father’s, you’d watched it swim above you through your haze. Foy’s choice to thrust the reader into the shoes of Pat here, as well as in other sequences throughout Patricide, works wonders. The pain felt by the character transfers to the reader through each use of “you,” and an immediate agency is set in place. The reader moves from spectator to participant in each long stretch of second-person text. Structured as single paragraphs, these bursts surge like a wild river, increasing the very pace in which each syllable is consumed. As tensions ratchet—and as white space vanishes from the page, replaced with a solid block of type, of “jiffy-lark-zing”s and “quick, quick, quick!”s—it is impossible to read these passages slowly. On the flipside, Foy often slows things down to equal narrative success, in particular when he uses nearly sixty pages to detail Pat’s first time smoking weed, stolen from his father’s stash at the tender age of ten. As he and his classmate, aptly named Burney McCarthy, trade joint hits, the world screeches to a halt. Time breaks from its normal rhythm, and a third-person narration explains how “everything swirled, everything spun, nothing made any sense.” Colors merge and vanish as the boys get stoned, and the language on display enhances their highs. Even when he’s not writing in this direct method, speeding up or slowing down time, Foy uses sharp, playful language and shrewd pop culture references to tell Pat’s travails. As he gets older, Pat not only snorts cocaine, he coins a new term for his insatiable consumption: “snuffleupagussing.” Then later, when he takes a stand for himself, he explains, “the monster had emerged like the monster from Kane in Alien, I was that monster, now, and I was damned.” These narrative choices are frequently brilliant, and they prove that, if Foy were a preacher, he’d have his congregation sitting on the edges of their pews every Sunday, hanging on the charm of his words. At its heart, Patricide is a novel about family, and how abuse and turmoil is often passed from parent to child. Despite his parents’ cruelty, Pat tries time and again to maintain a relationship, even while he plunges deeper into the world of drugs. Yet that hope is finally shattered when, at the age of seventeen, his parents ignore his Christmas wish for a guitar and instead give him a camera. As Pat looks at his gift, he comes to the conclusion that his parents want nothing more than to crush his ambitions. “My dream got in the way of the dream of my mother and father,” Pat says. “My dream took them from themselves.” It’s a provocative statement, and it leads Pat to a hard adulthood, but it also cements the character’s personality. If we’re to believe all humans are born with the instinctive drives that comprise their ids, then here is where Pat finally comes to understand his makeup, and the horror of it all is enough to drive any man to desperation. This entry was posted in Uncategorized and tagged Spring 2017 on May 1, 2017 by Kelly.